In this blog post we will look at the Corvette results from the Mecum Auction in Kissimmee Florida Jan. 3-13, 2019. 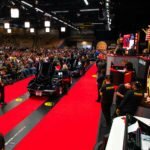 Mecum Auctions started the year off with a huge January. There were nearly 3,500 classic and collector cars that crossed the auction block at their Kissimmee Florida auction held Jan. 3-13 at Osceola Heritage Park. The auction saw a 72 percent sell-through rate and $107.5 million in overall vehicle and Road Art sales. Two thousand three hundred twenty-eight cars found new homes. There were three hundred seventy-one Corvettes that went up for auction during the ten days. Whether you were looking for a daily driver or that special Corvette, there were lots to choose from: Big Brake Airbox Corvettes, Big Brake Fuelies, Big Tanks, Resto-Mods, ZO6s, L88s, L89s, ZR1s, ZR2s, Pace Cars, Silver Anniversary, 35th Anniversary, 40th Anniversary, 50th Anniversary, Collector Editions, Grand Sports, Yenko Corvettes and even a Ron Fellows Edition. Two cars bid to a half-a-million but did not sell: Lot F130.1 a 1967 Coupe, Lot F157 a 1963 ZO6/RPO No.3. But not all the cars sold or bid to such substantial dollars. Twenty Corvettes sold under $10,000 and, they started at $4,950 for a 1989 convertible. If you are looking for a project car, there were some to find! Next, we will look at the total number of Corvettes offered by their series. C1: Sixty-four C1s crossed with Lot F163, a 1959 Corvette that sold for $167,200. C2: There were 104 1963-1967 C2 Corvettes. There were 26 collections. The only All Corvette collection was The Best in Black Corvette Collection included 11 Corvettes that span three generations. The two 1969 L88s that sold for $990,000 were from this collection. There was also a 1962 that sold for $159,500, a 1965 Big Tank Coupe sold for $330,000, a 1960 convertible sold for $82,500, 1965 convertible sold for $137,500, 1967 coupe sold for $162,250 and a 1969 L89 Coupe sold for $165,000. The Paul D’Alessandro Collection included 12 cars, and 10 were Corvettes. We do want to mention that the rest of the collections, almost all of them had Corvettes in them. If you missed the Mecum Kissimmee Auction, you missed a great auction, but you could find their next one coming up on our website where we have the schedule posted: https://vette-vues.com/mecum-auctions-schedule-2019/.